The new Stolford Flood Defence Scheme was opened on Monday 18 March by the Environment Agency and Simon Smits, Dutch Ambassador to the UK. EDF Energy contributed £81,000 to the £1.5m flood defence, which was part funded by the Wessex Regional Flood and Coastal Committee, EDF Energy and the Dutch government. 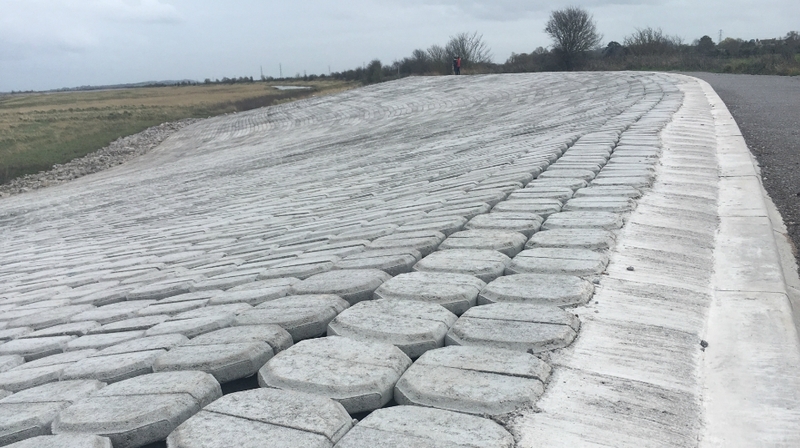 The Environment Agency previously spent £50,000 a year replenishing the ridge with 15,000 tonnes of shingle. It was decided the best solution was a Dutch system known as Hillblock, a type of block revetment, that uses a series of specially-shaped concrete blocks. Storm waves flow over the structure and enter a network of cavities between the blocks that absorb wave energy. Shaped like champagne corks, the blocks are made from high density concrete and held in place by steel piles and concrete kerbs. This is the first time the Hillblock design – commonly used in the Netherlands – has been used in the UK. It can reduce wave energy by up to 30% compared to the shore protection traditionally used.